Chicken Steak with Mushroom and Balsamic Sauce! I am trying to put this recipe on paper for a long time now. However something or other making me postpone it again and again. Today I am determined, I will pen (keypad) it down 🙂 . 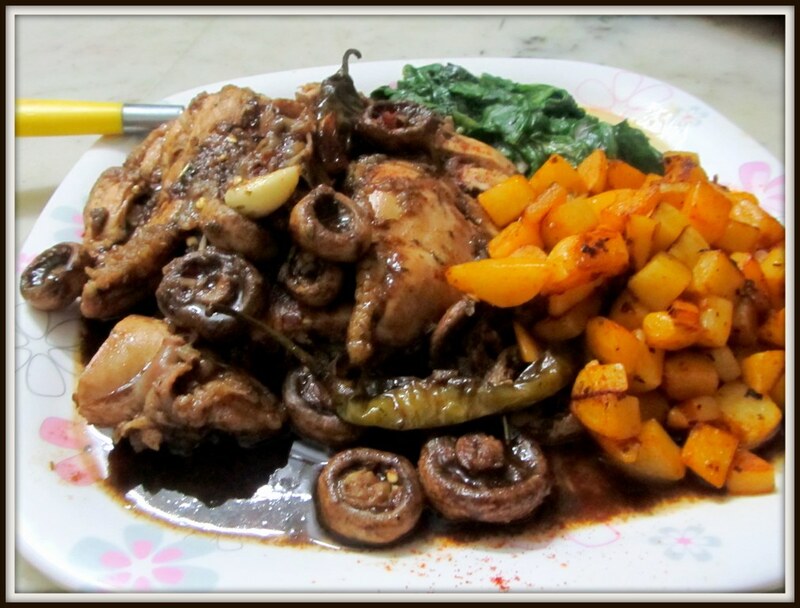 This recipe is a family favorite and one of those dishes, which gave me courage and confidence as a cook. 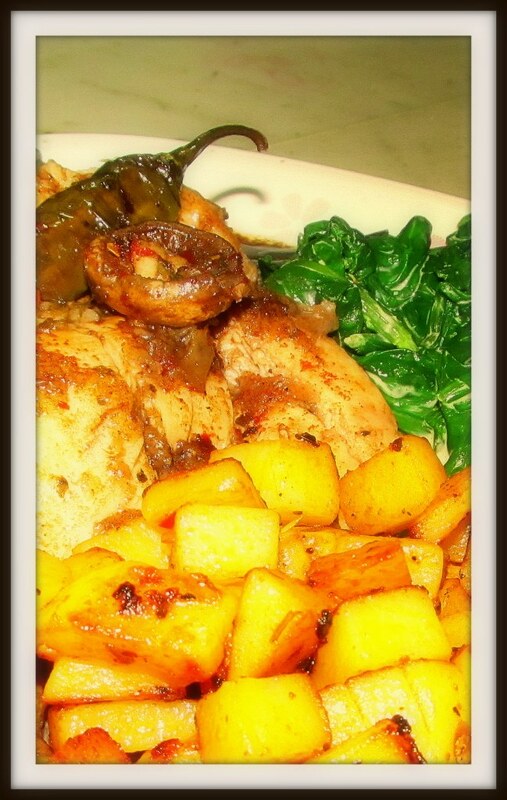 This is a full dish in itself, so no other main-course or side-dish is necessary. Let’s begin then! 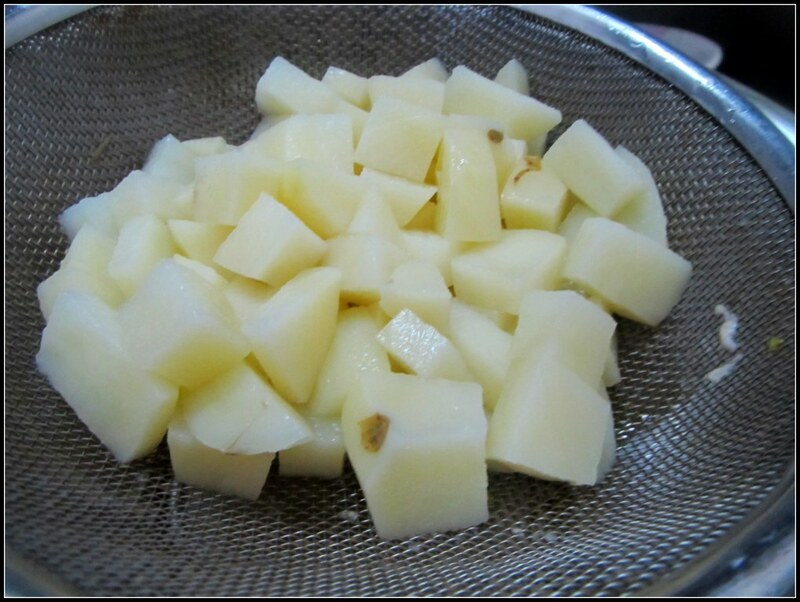 Cut the potato in small cubes. 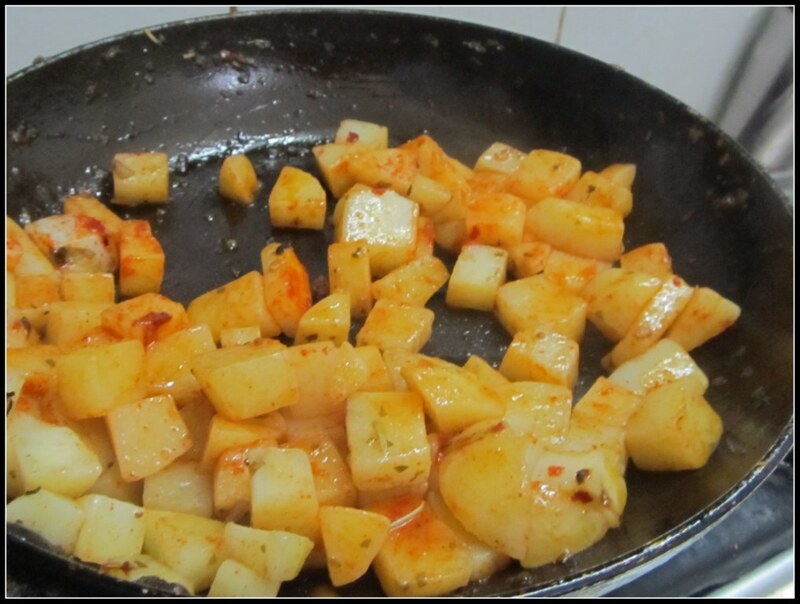 Take a sauce pan and add some water and a spoon full of salt. When the water starts to boil add the potatoes. 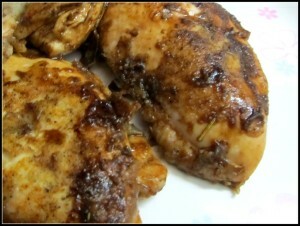 You can now move on to the preparation of chicken. 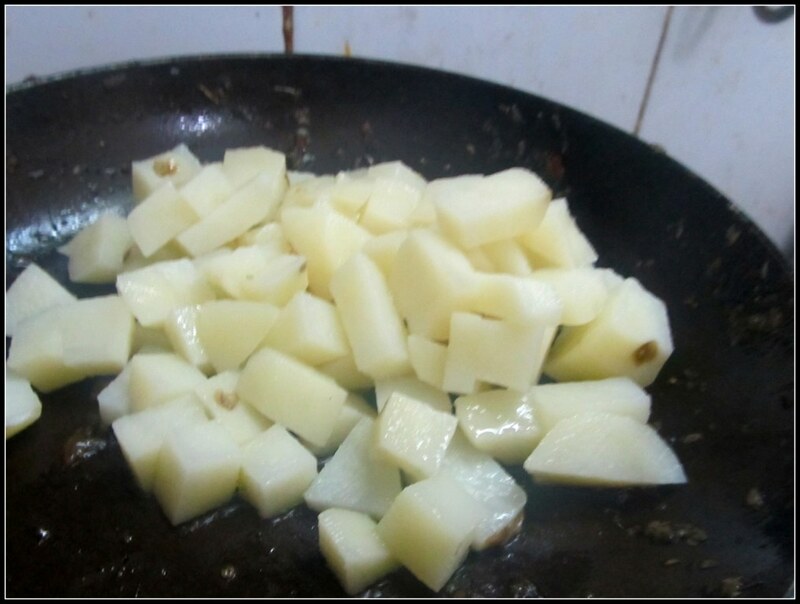 But keep an eye on the potatoes, when they are almost cook, take them out and keep aside. Take a plate and spread the flour. 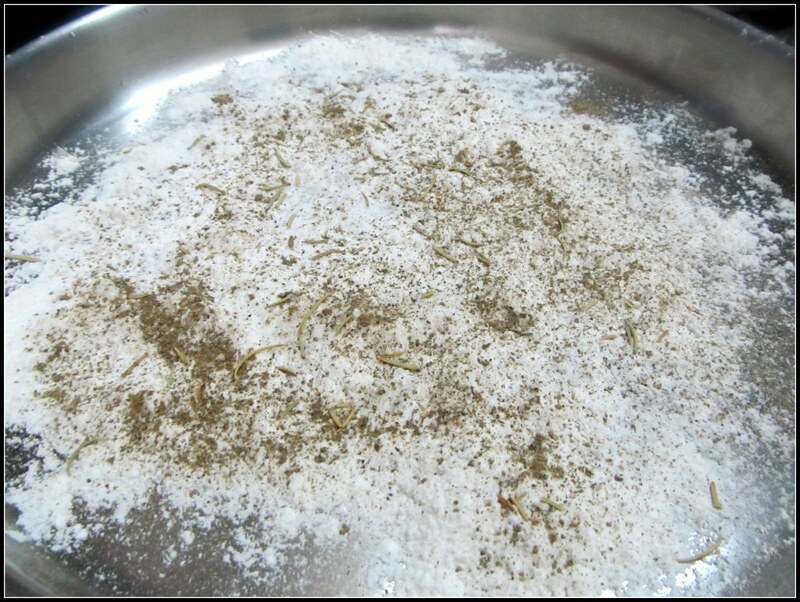 Sprinkle a pinch of salt and some pepper. Sprinkle all the Rosemary. It should look something like the next picture. Do Not Mix! 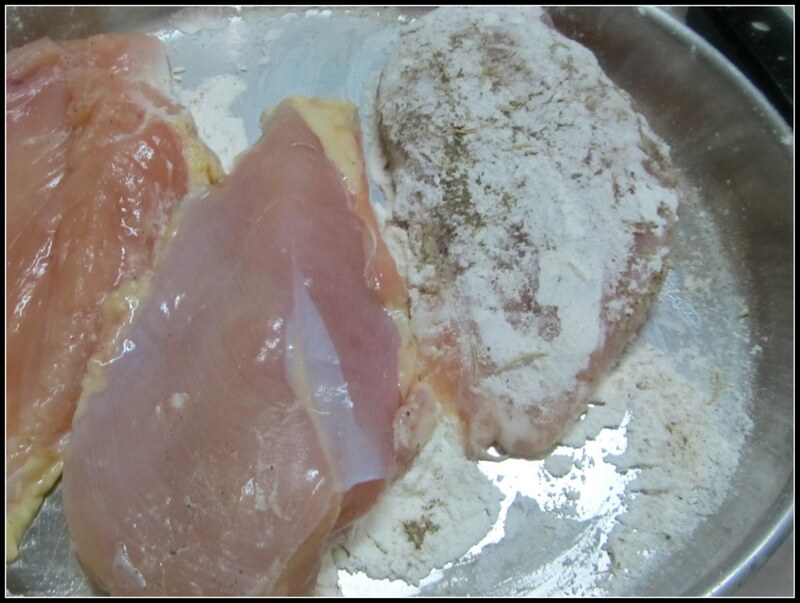 Take the chicken breasts and coat both the sides. Clean all the mushrooms under running water and remove all the stems. I do this by hand, as it saves a lot of time. And I have noticed that the base of the stems are most muddy (Obviously 😛). Hence removing them saves a lot of cleaning time. 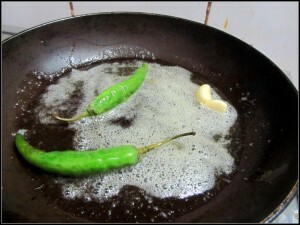 Heat some olive oil in a frying pan. When the oil is moderately hot, add a dollop of butter (I use normal Amul salted butter, the saltiness of the butter adds to the salt requirement of the dish). Actually you do not need butter for this dish, it is totally optional. When the butter melts (do not burn it) add two cloves of garlic and two whole green chilies. The idea behind the “whole” chili is to add the flavor of the chili without the heat. In case someone wants more heat, they can always use the chili while enjoying the dish. 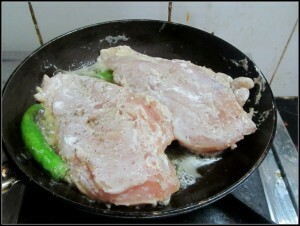 Add the chicken breasts in the hot oil. We are going to fry both sides of the breasts till golden brown. This technique is call searing. 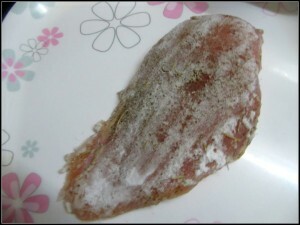 By frying both the side of the meat, we are not letting the water out. 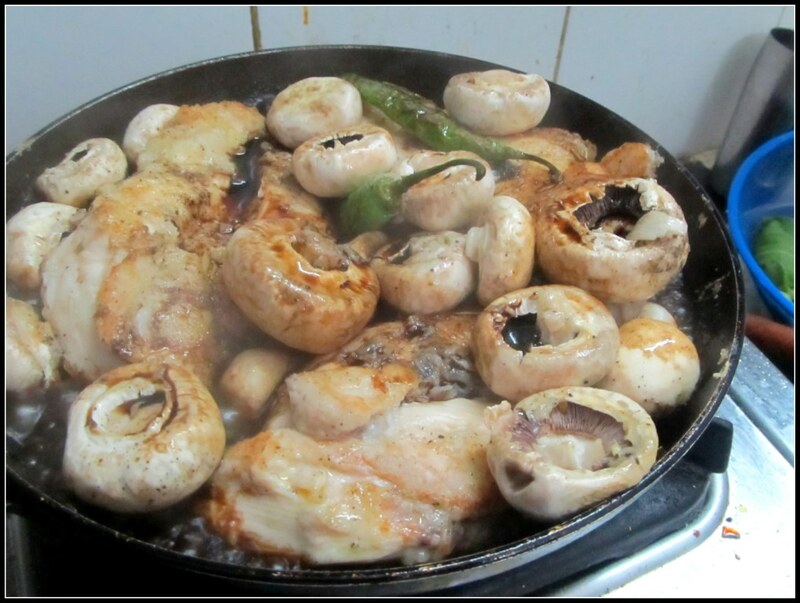 If you have prepared any other chicken dish before, you may have noticed, it releases a lot of water if you do not fry them at the beginning. For searing, fry the chicken breasts at each side for 1 min. We can see a golden brown layer formed. Keep turning the chicken for another 4 to 5 minutes. Now add the mushrooms in the pan. 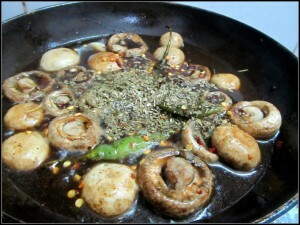 Add some salt and pepper (season) on top of the mushroom and if possible cover the pan for a minute. 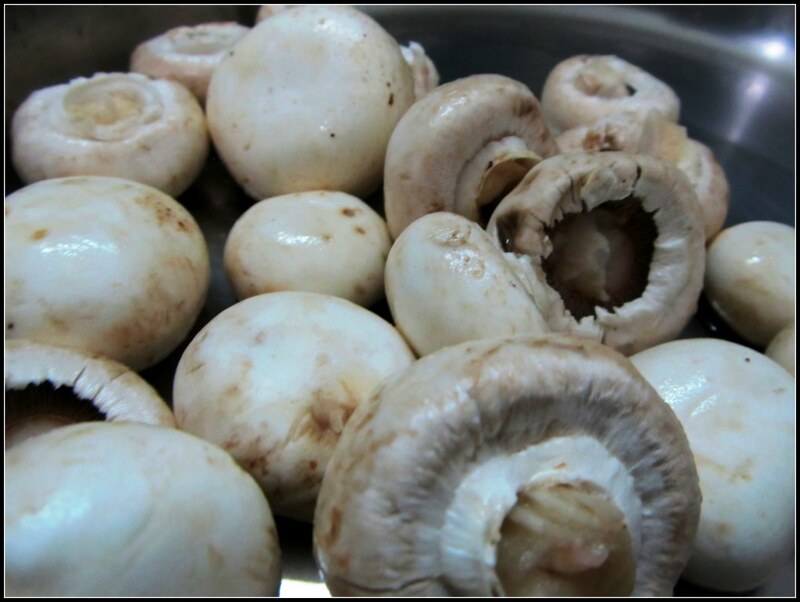 You will notice that the mushrooms have released a lot of water and reduced in size. Add the balsamic vinegar in the pan and mix. Take the chicken breasts out of the pan (If you overcook the chicken, it becomes very dry and chewy 🙁 ). Add the dried parsley and chili flakes and let the sauce simmer for couple of minutes. Taste, add salt or pepper if required. If the sauce tastes very sour to you, sugar can be added. 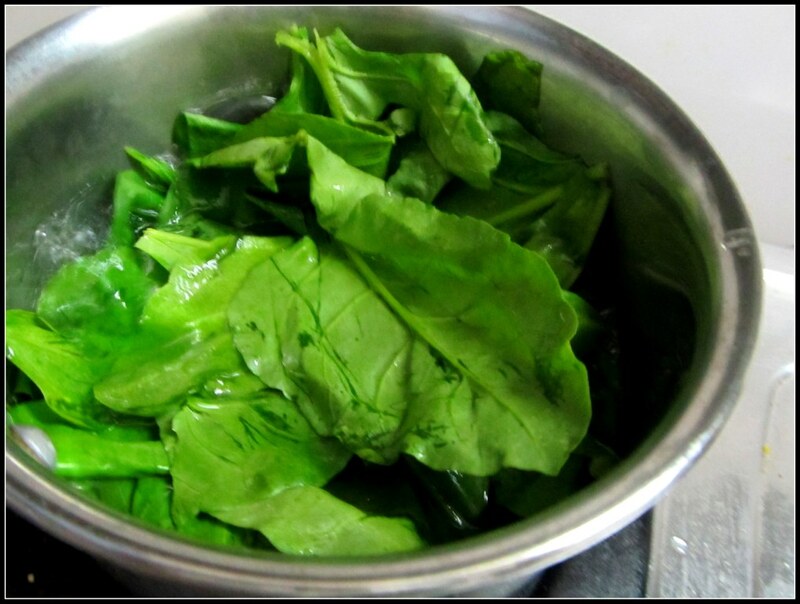 But if you simmer it for longer time, the sourness goes reduces a lot. Therefore, wait before you add sugar. Or you can add a little sugar now and then add little more balsamic vinegar to adjust the taste. 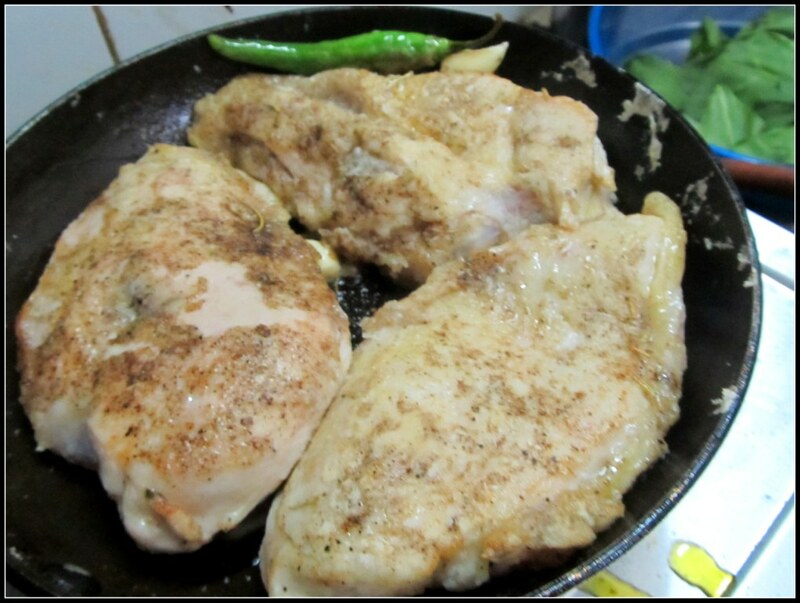 Make a cut in the thickest part of the chicken to check if it has cooked through or not. If the inside is still very pink (raw), add the chicken in the sauce and simmer till it is fully cooked. 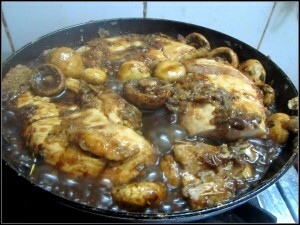 If the chicken breasts are cooked through and the sauce suites your taste-buds, take the frying pan off the heat. Pour everything on a plate. Now we can move on to the other part of the dish. 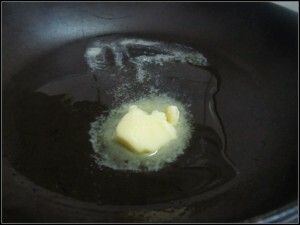 Take the same frying pan, you do not need to clean it, and add some more oil. 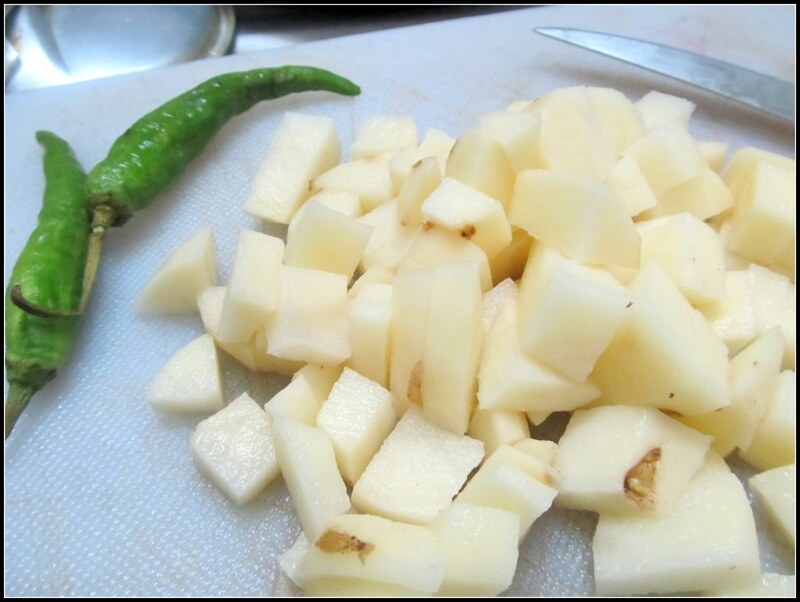 When the oil is hot, add the boiled potato cubes. Add red chili powder. Fry till potatoes are fully cooked. 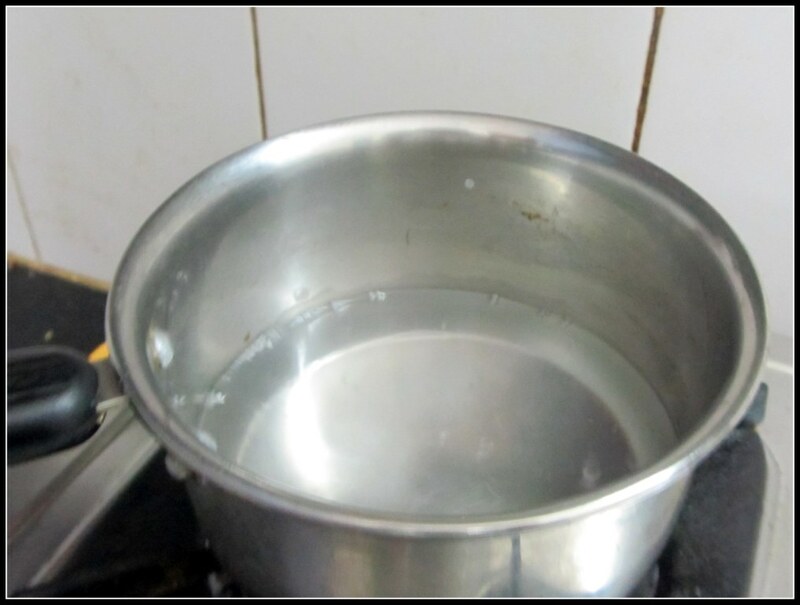 While potatoes are cooking, boil some more water. 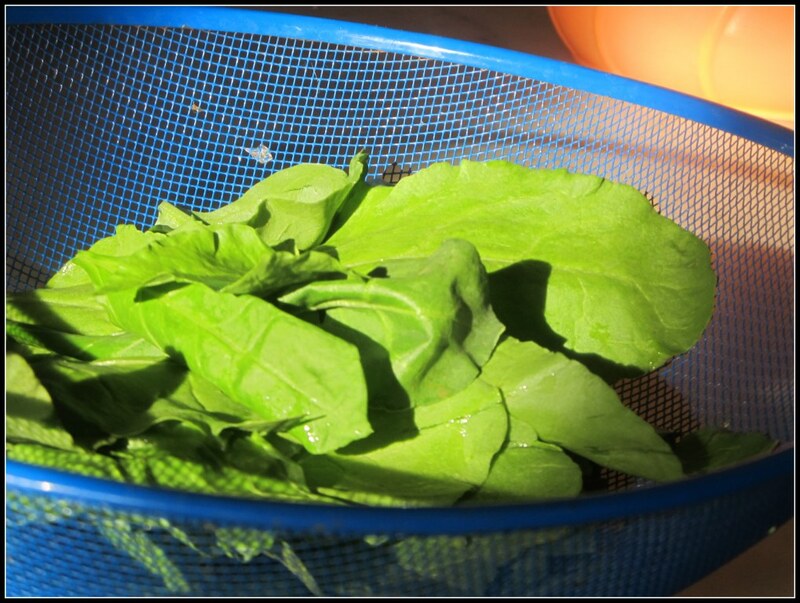 When the water starts to boil add all the spinach leaves. Keep them there for 15 to 20 seconds and take them out. Now time to assemble the dish. 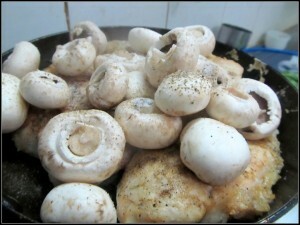 Here is your pan fried chicken breasts with mushroom and balsamic vinegar sauce. with a side of fried potato and spinach. Enjoy! 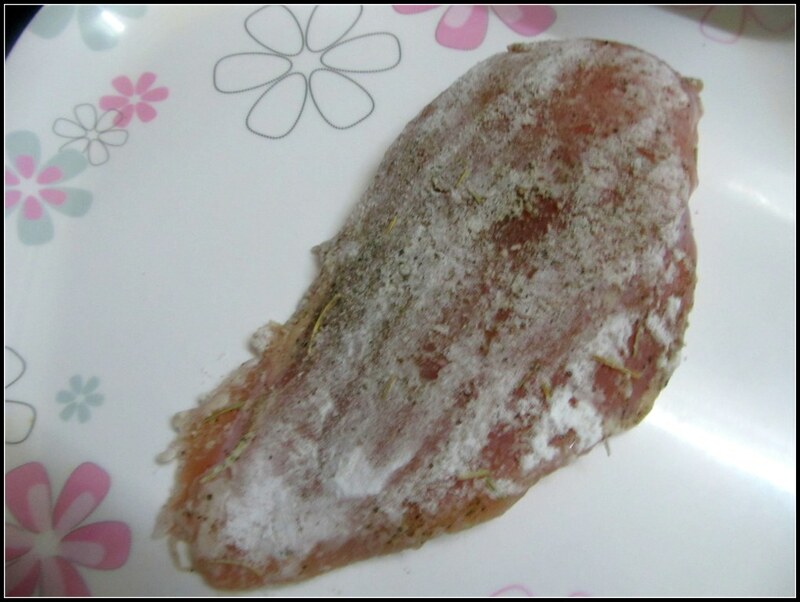 Coat both the side with flour, salt, pepper and rosemary. Take the chicken out and let the sauce simmer some more. Taste and adjust as per your palate. Check the thickest part of the chicken breasts by cutting with a knife. 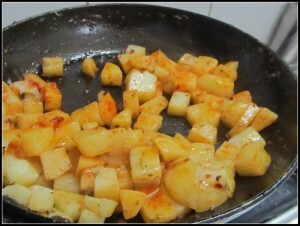 If still pink, return the pieces to the pan and simmer in the sauce till cooked. You can dice the chicken up at this point and then add them back to the sauce. Add the almost cooked potato pieces.